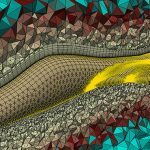 Pointwise has released a new, updated version of its computational fluid dynamics (CFD) mesh generation software. 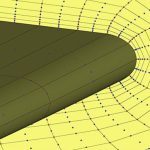 Building on experiences gained through participation in CFD workshops, this new release includes the ability to customize the near-wall mesh for accurate and efficient boundary layer resolution. Growth Profiles provide a rapid way to compute the meshing attributes for resolving laminar and turbulent boundary layers. Given three simple flowfield parameters, boundary layer theory is used to compute and apply the appropriate growth rate schedule for T-Rex. Advanced users can also create a completely customized cell growth schedule to meet the precise needs of their application that is built from spacing values, the desired number of constant layers, the desired number of accelerated layers, and growth rate acceleration. Some of the technical details for this work can be found in the paper, A Qualitative Study on the Effects of Mesh Guideline Modification for Unstructured Mesh Generation of the NASA High Lift Common Research Model (HL-CRM), by Ms. Woeber and William T. Jones of NASA (AIAA paper no. 2018-3401). 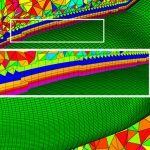 Pointwise Version 18.1 R2 also includes several smaller features and defect corrections. To download this update go to www.pointwise.com/downloads.